QUEEN’S PARK -- Today the first Green Party legislation in Ontario history passed a key vote in the legislature with unanimous support from all parties. “This day belongs to people in southern Ontario who for decades have stood up to protect drinking water for our children and grandchildren. 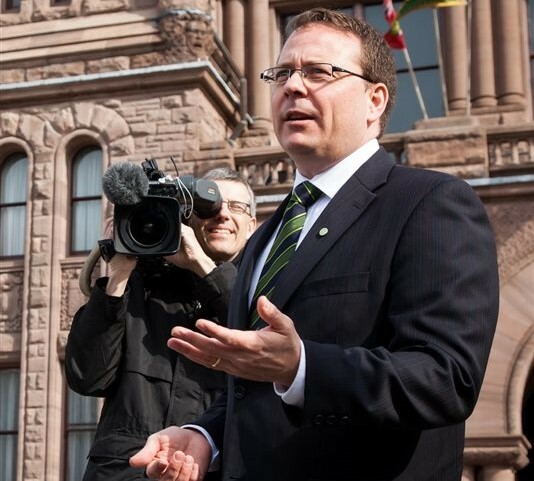 This is about putting the public good before private interests,” said Mike Schreiner. The Paris Galt Moraine is an essential water recharge area in Ontario’s largest watershed - the Grand River Watershed - purifying water at no cost to the citizens of Guelph and a surrounding region expected to grow to one million people in the coming decades. Amidst growing pressures from climate change, resource extraction and sprawl, calls have grown for the province to step in to protect the ecologically sensitive area. “This is about conserving what nature can do for free, so I cannot think of a more fiscally responsible solution. Failure to act could put the government on the hook for hundreds of millions in water infrastructure, like an expensive pipeline from the Great Lakes,” said Schreiner. Schreiner modelled his private member’s bill on the Oak Ridges Moraine Conservation Act passed unanimously with all party support almost twenty years ago by a PC government to protect drinking water as it flowed into the GTA. Schreiner worked for months to write the legislation, consulting with water experts, First Nations, municipalities, farmers and MPPs from all parties. While votes often fall along partisan lines, today was different, with unanimous support from all parties. “I’m glad my colleagues unanimously showed their commitment to Ontario’s water today. Safeguarding water and food-growing farmland should not be partisan issues. Let this be a first step towards all-party collaboration to protect the places we love,” said Schreiner.